In 1913, a parcel arrived in Cambridge for GH Hardy, the English mathematician. It contained a mathematical manuscript from Srinivasa Ramanujan, a poor clerk in India, with a covering letter asking for financial support. The manuscript contained wild and fantastic theorems without a single proof. Initially, Hardy discarded the manuscript as coming from a crank, but the strange formulae that it contained bothered him, and on reflection he decided to go through the document with Littlewood, his colleague. Their conclusion was that they had found a genius. 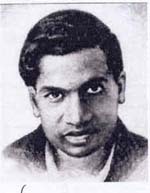 Hardy obtained funding for Ramanujan to come to Cambridge, and they collaborated until Ramanujans death from tuberculosis in 1920. I have been fascinated by them ever since. Firstly, they are so visually elegant. Secondly, their elegance belies the difficulty of proving them. How would you even begin to attack the one above? In this article we are going to look at infinite continued fractions - continued fractions that do not terminate. As background, it would be useful to look at previous NRICH continued fraction articles (which you can find here (Continued Fractions I) and here (Continued Fractions II) ). In order to understand this one it would also help if you were familiar with Taylor series expansions of functions. I should confess that nowhere in this article is there any mention of convergence of these series. The series below do converge and the proof is rather interesting but unfortunately it would double the size of this article so I have had to leave it out. If you have difficulty with this article, then please post your queries in the "Onwards and Upwards" forum on ask nrich where someone will be happy to help out. The integer on the left of each denominator is alternately an odd number and $1$, i.e. $1,\,1,\,3,\,1,\,5,\,1,\,7,\,1,\,9,\,\dotsc$. In fact, if you do this either on a calculator or spreadsheet, the pattern eventually breaks down. Can you guess why? These continued fractions converge quite rapidly towards the true value of $\tan(1)$, and it does not need more than $20$ terms before the accuracy is within $12$ decimal places. Since the precision of most spreadsheets and calculators does not exceed about $12$ decimal places, numerical errors mean that computations beyond the $20$th term of the continued fraction will be likely to be incorrect. This continued fraction exhibits a very obvious pattern! In fact, it is also the easiest to prove. As much as I would love to prove them all, space means that we are going have to be content with focussing on (5). and use these results to compute the power series expansion for $\sinh(x)$ and $\cosh(x)$. Reveal the hidden text if you need help. Next we need to talk about "hypergeometric functions". There are actually a whole family of them but we'll just look at one. Don't worry if you haven't come across them before, we'll derive any properties we need. Can you prove it for the first and work out what the 'a' is for the second? which is the expansion of $\sinh(x)$. This is proven by demonstrating that the power series are identical (term by term) on both sides of the equation. We have proved what we set out to and more - we have a continued fraction for $\tanh(x)$ for arbitrary $x$. It may not quite match the complexity of Ramanujan's sum, but it is a start!